This beautiful example has patterns associated with rugs from different regions. The central medallion is similar to those found on the Small Medallion Usaks, and the large leaves that surround it are normally found on the rosette medallion rugs. The design of a carnation and large leaves seen in the corners of the field is more usually found on single- and double-niche rugs from southern Manisa. Also in each of the corners is a small curled leaf that can be traced back to archaic animal motifs. 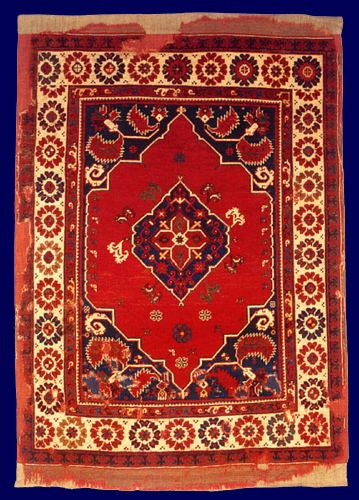 The inner guard border is found on many small Usak rugs, in particular those with coupled-column designs, and the rosette main border is unusual but not unique.